The word legacy has been on my mind recently. I always think of one’s legacy as divided up into three areas: job, career, life’s pursuit. Many can achieve one or two of these areas. It is hard to attain all three. 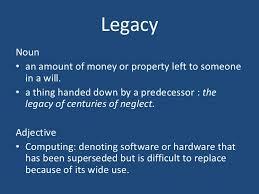 I think since I have been hyper focused on a specific project at work and my personal life has been a bit off balanced, that is why I have been pondering legacy and what it means. For over half my life I have been doing communications at Fortune 500 media and technology companies. I started young. Achieved young, but made sure to focus on friends along the way. As you head into thinking about a long-term relationship, family, and adult years – at least for me – the balance will be critical. Once you hit fatherhood or professional success, having that circle of friends and sense of self is critical. So back to the concept of legacy or more appropriately the concept of success. Who you are isn’t what you achieve. In my mind there are two measures of a person. 1) How many people show up to help you move. 2) How many people show up for your funeral. The measure of a person, their personal legacy, is truly what they establish within their circle of friends and how they decide to build their family.